Southside Ashpole’s new principal, Bruce Major (right), walks the halls of his new school with Tony Helton, CEO of Achievement for All Children, which is the managing partner of the school. ROWLAND — Southside Ashpole Elementary School’s new principal strolled the halls of the school last week and liked what he saw. Bruce Major, 48, was selected by the North Carolina Innovative School District and its managing partner Achievement for All Children to lead the low-performing school that it has taken over from the Public Schools of Robeson County for a five-year stint. 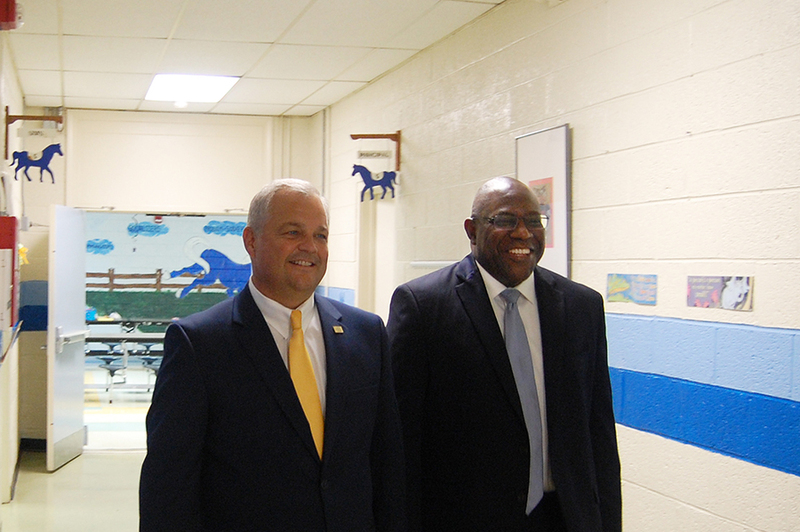 Eric Hall, superintendent of ISD, and Tony Helton, CEO of Achievement for All Children, said Major is a transformative leader with proven experience in turning around schools like just like Southside Ashpole. The small school in Rowland is another in a series of professional challenges for Major. “I’ve been in Rowland all day today, and I’m excited,” Major said. “There are a wealth of resources here. Major stopped by the local barbershop to take the pulse of the community — and got a haircut too. He expects to be in Rowland for five years and turn a failing school into a top performer. The Sumpter, S.C., native is a career educator, beginning as a school psychologist and moving into administration. Major’s last assignment was leading an international school in China, but it was his time spent at a charter school in Charlotte that is the most meaningful to students and the community in Rowland. “Sugar Creek is much like Southside Ashpole with a 99 percent minority enrollment,” Major said. “We were able to turn a low-performing school into the top-performing school in the state. “We moved the school within five years with steady growth each year,” he said. That is also the plan that Achievement for All Children and the Innovative School District have for Southside Ashpole. Major will make a salary of $100,000 per year. Hall said there was a great deal of interest in the position. Southside Ashpole is the first of at least five schools that ISD is tasked by the state to takeover as a turnaround model. As a charter school principal, Major is already familiar with the curriculum that Achievement for All Children has selected for Southside Ashpole classrooms. He will also see students in uniforms, the school leaders have decided. On hand to meet with the new principal were members of the Achievement for All Children board of directors, Rowland Mayor Michelle Shooter and Town Clerk David Townsend. Major is currently a Charlotte resident, and Rowland has a population of just more than 1,000. The differences do not worry him. Major begins work full time on Monday.